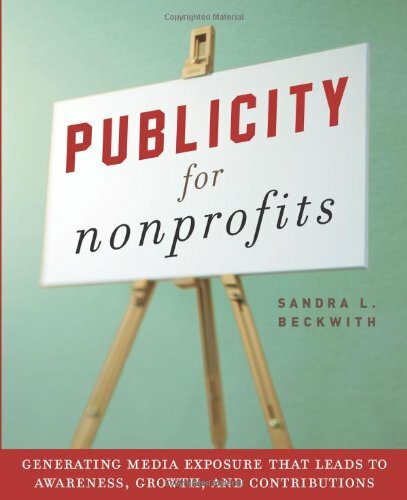 Order ‘Publicity for Nonprofits: Generating Media Exposure That Leads to Awareness, Growth, and Contributions’ by Sandra L. Beckwith, available from Amazon.com by clicking on the book cover above! If you’ve seen the NBC sitcom “Men Behaving Badly,” Sandra Beckwith says you’re already familiar with her field of study. The editor of The Do(o)little Report, a bimonthly newsletter that answers the musical question, “Why can’t a man be more like a woman?,” says the TV show touches the same nerve as her newsletter’s popular “Stupid Men Tricks” column. As for the underwear in the microwave trick, that was only seen in a promo, not an actual episode and no, he hasn’t tried it at home. Beckwith has enjoyed a great deal of notoriety and visibility thanks to The Do(o)little Report, including stories in USA Today and The Wall Street Journal and an appearance on “The Montel Williams Show.” The newsletter — which boasts more than 5,000 subscribers — also led to a 1995 book, Why Can’t A Man Be More Like A Woman (Kensington). She got started four years ago when she noticed that women were becoming more vocal about the things that bothered them in their relationships with men. Repairing torn jeans with a stapler. Beckwith’s favorite “Stupid Men Trick” of all-time was the guy who, rather than throw out a pair of socks that had a hole on the ankle, used a Magic Marker that matched his socks and colored in his ankle. The Do(o)little Report transcends gender and generations, as Beckwith’s older daughter demonstrated a few years ago. Beckwith thinks her daughters will be better adjusted adults for the lessons they’ll one day learn in The Do(o)little Report.